This is an extremely simple pilaf flavoured with leek and button mushrooms alone. Normally people add stock (like vegetable or chicken stock) but I like to keep it simple with clean flavours and free from any MSG! Leek is yet another vegetable that I have never cooked with before. I always find it next to celery in our grocery store and keep wondering how people use this thing. Then recently I read about the health benefits of leeks in a health magazine and I had to try it! Warm olive oil in a deep pan. Fry the bay leaf for few seconds and then add the finely sliced garlic and green chillies. Saute well for couple of minutes. Add the finely sliced leek and saute well till they begin to brown. Add the mushrooms and keep frying till the water evaporates and they begin to brown. Season with salt and pepper. Add the dried herbs. Add the two cups of water and bring it to a boil. Do a taste test and adjust salt and pepper. Add the rice. Stir gently. Cover and cook on low flame till rice is soft and nicely done. Keep stirring gently once in a while. 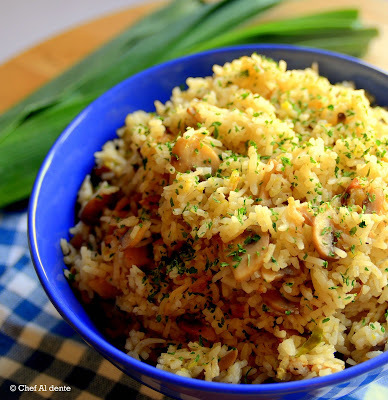 Healthy and delicious, even I have not cooked with leeks yet, would love to try this pilaf..
Why have I never had pilaf before? It looks fabulous! Definitely going to try it soon! Its seems too healthy and yummy as well. Would love to make it at home.